Continuing the matcha theme with these two low carb gluten-free matcha donut recipes! I wanted to capitalize on the health benefits of the matcha powder where my children were concerned; so I decide what better way to feed them matcha than with donuts!? They loved the Matcha Tahini Mango Tuna Sushi recipe and our Kiwi Matcha Juice so I had high hopes for these donuts. Before we get to the donut recipe, I wanted to let you know I'll be giving away one 4 ounce packet of culinary grade matcha. To enter all you have to do is comment at the bottom of this post to answer the question “have you ever tried matcha?” Simple, right? I have one more matcha recipe for tomorrow, so if you haven't already, make sure to sign up as a member on the Homepage so you won't miss this recipe or giveaways in the future. I wanted to make a variety of donuts for my family including myself. That meant I wanted them to be low in carbs, sugar-free and gluten-free. Don't worry, if you prefer powdered sugar to Swerve, you can still make these delicious donuts and reap all the benefits of matcha! 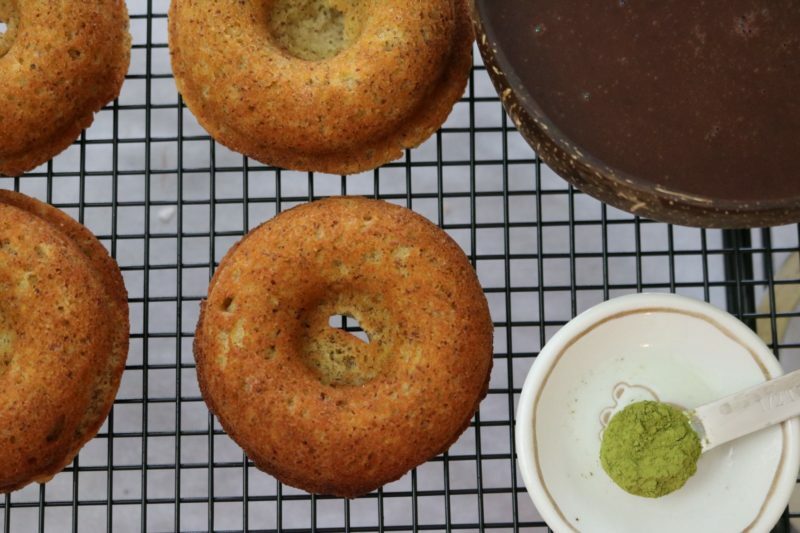 That is how these two low carb gluten free matcha donut recipes were born! The first batch of donuts I made are cake donuts. The ingredients are pretty simple and you can easily change the flavor by adding a different type of extract. 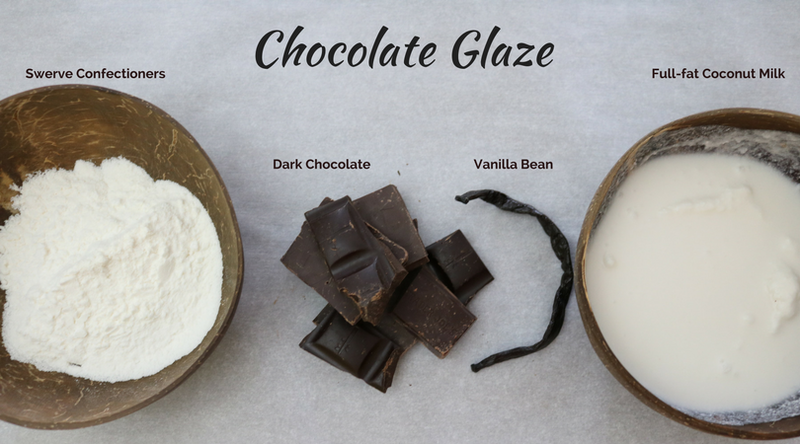 The chocolate glaze is also fairly simple. I really do prefer to use real vanilla bean seeds, but you can always just use a teaspoon of vanilla extract. If you do use the vanilla bean just slice it open and scrape out the seeds of one bean! Delicous. 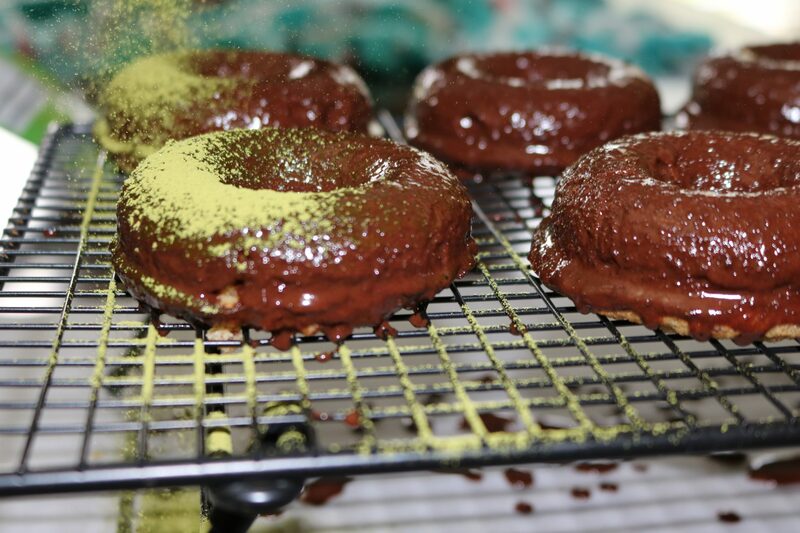 Next, I made a batch of chocolate donuts to sprinkle with Swerve Confectioners (or powdered sugar) and matcha. 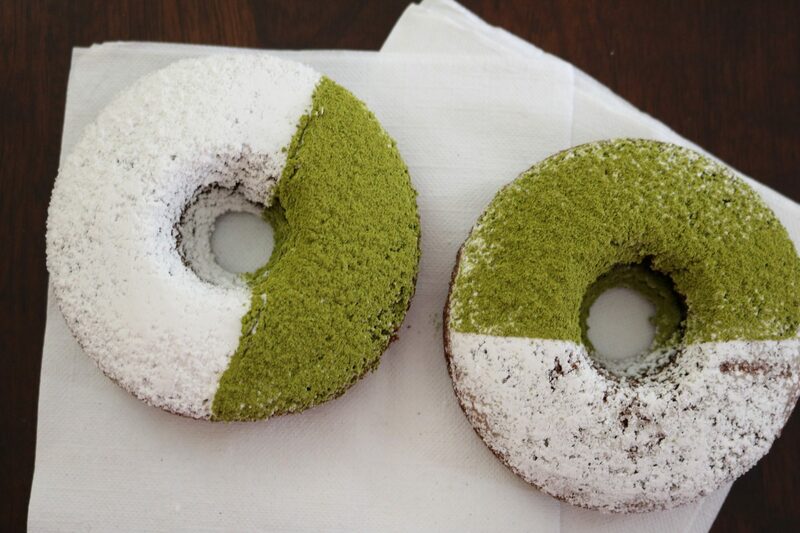 My mom suggested I call these Half n Half Matcha Donuts. First I sprinkled them with the Swerve. Then I covered half of the donut with a square of parchment paper and sprinkled them with the culinary grade matcha green tea powder. The matcha is perfectly balanced with the sweetness of these donuts! 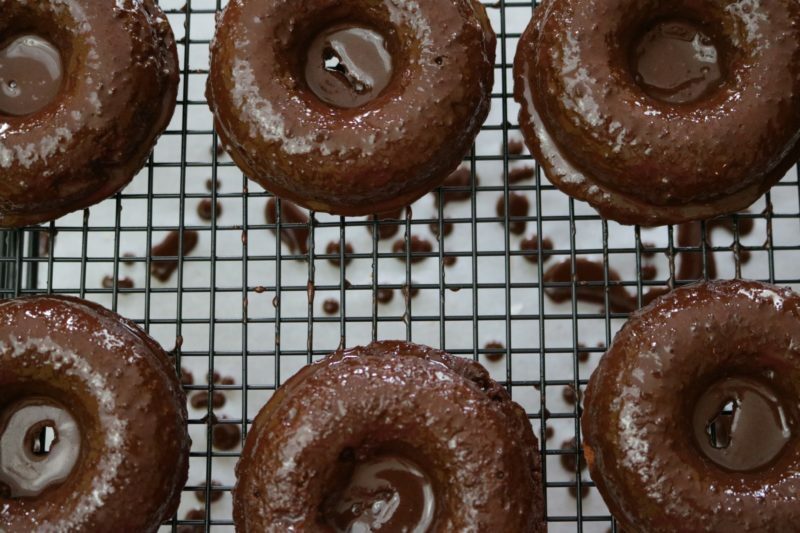 I've included recipes for the plain cake donut, chocolate donut, and chocolate glaze. The plain donut recipe is at the bottom. 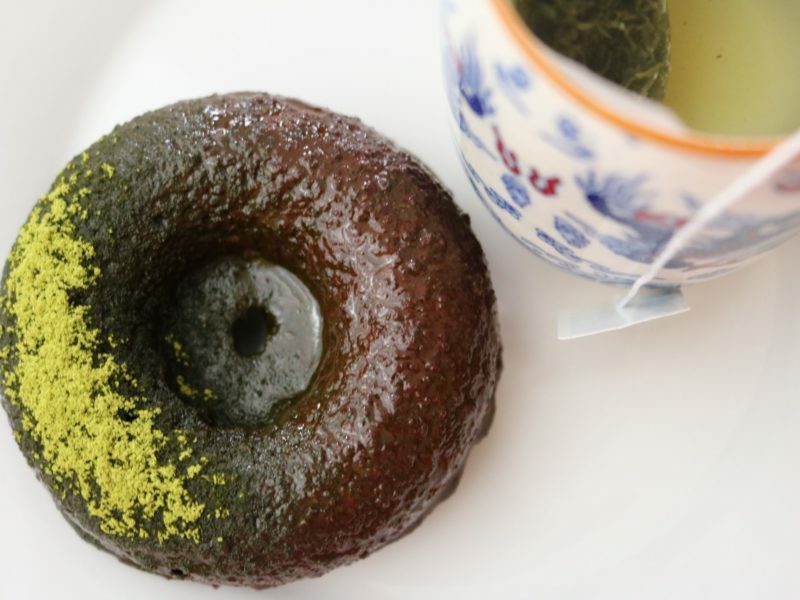 I hope you enjoy the matcha donut recipe and experiment with matcha powder! Preheat oven to 325F and grease a regular-size donut tin. In a mixer, combine eggs, coconut milk, and vanilla extract. Blend just enough to mix. Add almond flour, coconut flour, cocoa powder, Swerve confectioners, baking powder, and salt. Add oil and blend until well combined. 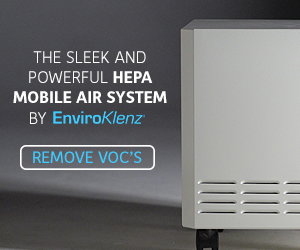 Remove and let cool 10 minutes on a wire rack. 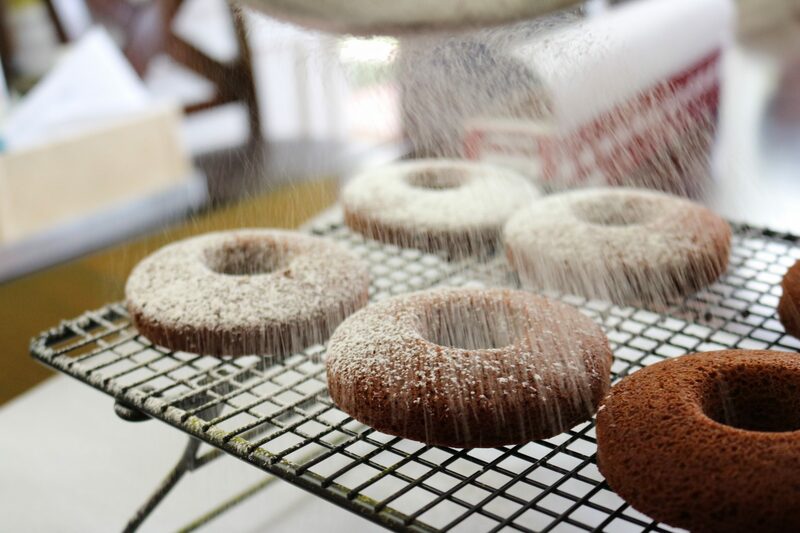 Flip donuts onto a wire rack to cool thoroughly. Repeat with remaining batter until gone. Heat on low, stirring, just until the chocolate melts. Add the vanilla and stir well to combine. 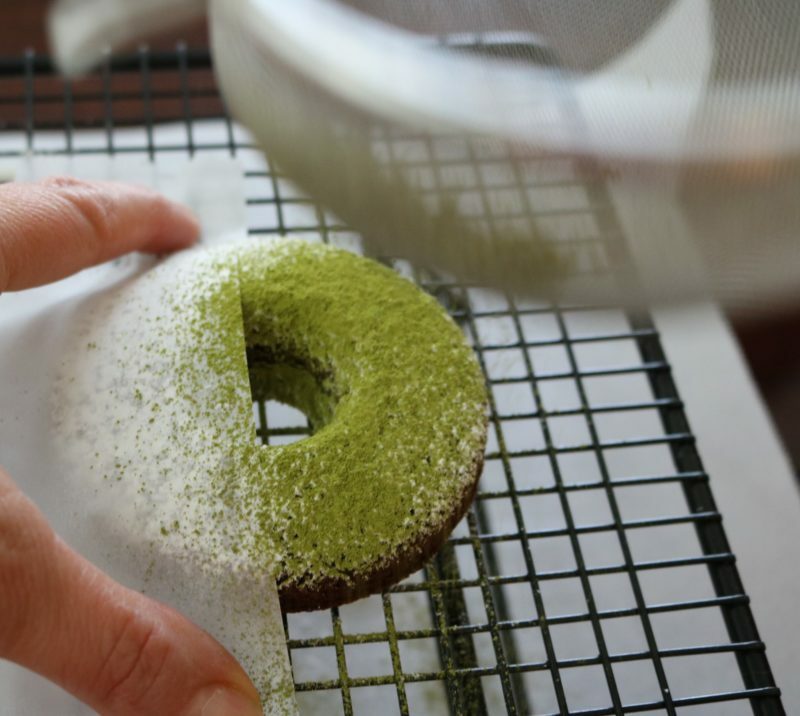 Using a hand held mesh screen strainer, sift the culinary matcha onto the donuts. 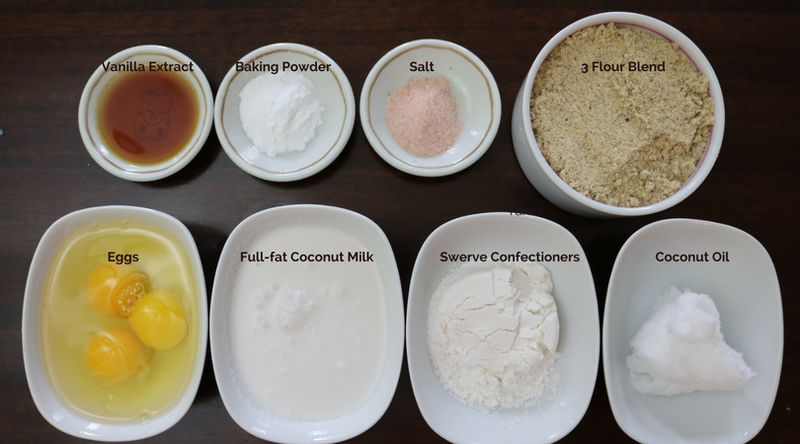 I used about 1/4-1/2 teaspoon per two donuts but you can use the amount you like depending on your taste. Because the donuts are gluten free they are more fragile than wheat flour donuts. When I dipped these donuts in chocolate I used a five finger grasp (my whole hand!) and dipped the top of the donut into the chocolate - its messy. My fingers also got chocolate on them, so this tells you how good a grip I had on the donut. Alternatively, if you don't want chocolate on your fingers, drizzle the chocolate on top; but make sure to put a plate or bowl underneath to catch all the extra chocolate run off! With only 2 grams of net carbs per donut, you can enjoy a few even if you are following a low-carb, keto, Paleo or THM diet plan. Pipe donut batter into donut pan. Bake at 350 degrees 15-18 minutes or until a toothpick comes out clean. I have never tried matcha, as far as I know. I’m definitely intrigued about how it tastes. Also, how these doughnuts taste…. douhhnuts are my love language. Yes, I have tried Matcha. It was in a bottled tea product. I have never tried powdered matcha, though. Hey Nancy! How are you!? 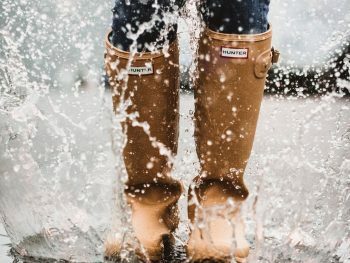 Are you still rockin’ the THM world? You will have to try the matcha donuts, as I remember you were an excellent baker! I don’t think I’ve tried matcha but I’ve heard of it. I do love ?!!! YUM! I have tried matcha before at bakeries and cafes, but I’ve never made anything with it at home! I want to find a coffee shop that offers a matcha latte! I have tried it before but only at a coffee shop! I want to try making matcha tea myself!